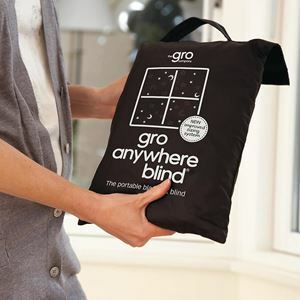 GRO ANYWHERE BLIND - Portable blackout blind,The portable blackout blind that goes anywhere with you to make a perfect sleeping environment for your baby! The Gro Anywhere Blind is a perfect portable bling that can be carried anywhere with you to create a perfect sleeping environment for your baby for when its still light outside. It can be easily attached to the glass using suction cups. The Gro blind fits properly blocking any light that comes into the baby's room thus disturbing their sleep. The New version of Gro Anywhere Blind has velcro belts for easy adjustment and comes in moon and stars print.